I was reviewing my weekly schedule and realised that a few important activities were missing. 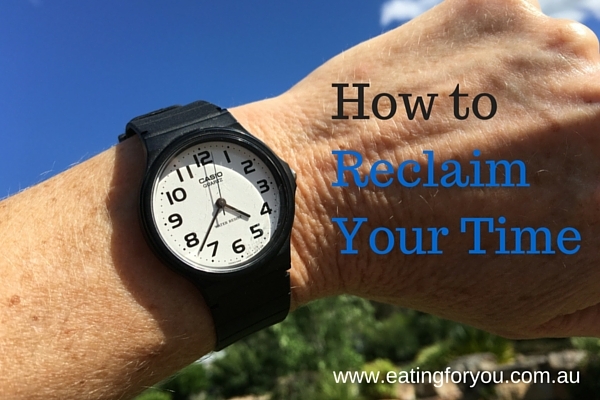 The words, “reclaim your time” popped into my head. And I thought, “how true”. Our time is ours to use as we wish. Or is it? The first step to reclaim your time is a review of how you spend your time now. The simplest way to do this is to record everything you do in your diary (electronic or paper) for one week. This includes work and other commitments and activities e.g. walking the dog, shopping, preparing meals and watching TV. To make recording a little less tedious, some activities are repeated each day, so these don’t need to be recorded in full everyday. I would aim for 15 to 60 minute recording intervals. Sleep is essential for the health of our mind and body. Current recommendations suggest that adults require 7–9 hours of sleep on average. Reclaim your time for sleep, by making it a priority. When reviewing your weekly schedule or diary, put sleep in as your first priority. When we have adequate sleep we function more efficiently and effectively so we can make better use of our time. Eastern medicine for thousands of years has based eating and lifestyle advice on maintaining the health of our gut. Western research is also uncovering the ways in which our gut microbiota influence our mind (mood, attention and focus) and body. Nutrition is vital to keeping us running at our peak, so keep coloured fruits and vegetables and pulses on the menu. Fermented foods such as yoghurt, cheese, tempeh and sauekraut also help to support a healthy gut. A way to reclaim your time is to replace transport with movement, such as walking or cycling to work or the shops. Many of us have the opportunity to walk or cycle to work, or part way to work, instead of driving or catching public transport. Small sessions of walking all add up, for example you might take a 20 minute walk to a bus stop, take the bus and then have a 10 minute walk from there to your workplace. Do this twice a day, and you have walked for an hour. In city traffic, a combination of walking and public transport might actually be faster than driving. Mindfulness is a way of being that focuses our attention on the present moment with an open mind. It allows us to reassess certain situations in our life and consider alternative choices. With practice our minds become less cluttered, and the pros and cons of our different choices become clearer. By gaining more clarity and confidence with our decision-making we can reclaim our time. We spend less time worrying and procrastinating. Mindfulness is good for your health and for reclaiming your time. Next week I am commencing a three part series on mindfulness. So stay tuned to learn more about practical ways to become more mindful in your day.